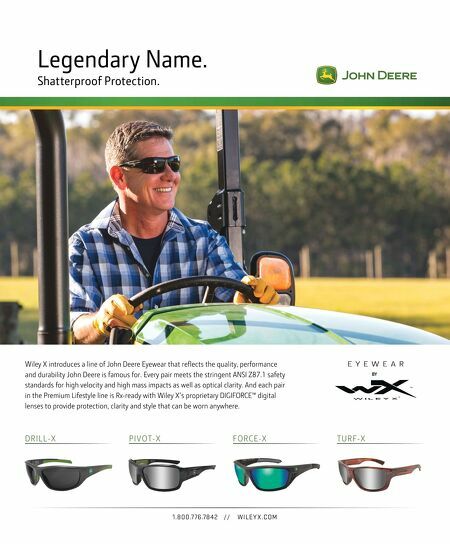 1.800.7 76.7842 // WILEYX.COM D R I L L-X P I V O T-X T U R F-X F O R C E-X Wiley X introduces a line of John Deere Eyewear that refl ects the quality, performance and durability John Deere is famous for. Every pair meets the stringent ANSI Z87.1 safety standards for high velocity and high mass impacts as well as optical clarity. And each pair in the Premium Lifestyle line is Rx-ready with Wiley X's proprietary DIGIFORCE™ digital lenses to provide protection, clarity and style that can be worn anywhere. E Y E W E A R Legendary Name. Shatterproof Protection.